Another launch of Russia’s Bulava missile ended with a failure. The Dmitry Donskoy nuclear cruiser launched the ballistic missile in the White Sea on July 15. However, the missile destroyed itself after a malfunction in the primary stage of the rocket. Russia has held ten test launches of the Bulava rocket since 2003: five of them proved to be unsuccessful. The Bulava missile complex is capable of carrying up to ten individually guided nuclear warheads. The missile can hit targets at a distance of up to 8,000 kilometers. Bulava is supposed to become the basic missile for state-of-the-art nuclear-powered Borei class submarines. Russia’s major shipyard, Sevmash Enterprise, is currently building three of such nuclear submarines. Their constriction is said to be complete by 2010. Experts say that several consecutive unsuccessful launches of the missile endanger the whole project. The missile was designed to minimize modern threats like the US missile defense system in Eastern Europe. Many Russian experts believe that Moscow intends to use the new missile for political reasons to earn Russia the reputation of a superpower. However, Russia will not scrap up the Bulava project even after the recent failure since the missile is needed to maintain the nuclear parity with the United States. It was said in 1998 that the Bulava project would be relatively inexpensive. The project was evaluated at $227 million. For the time being, it is obvious that Bulava has taken more than $300 million in ten years. Alexander Khramchikhin, the deputy director of the Institute of Military and Political Analysis, believes that Russia should stop the tests of the Bulava missile. “It is obvious that one should stop testing the missile and leaving money on the table. Russia should work on the Sineva missile – the only missile that flies. However, in this case it’s not clear what to do with the submarines that have been designed to carry Bulava on board. Billions of rubles have been wasted on the submarines and the missile – who is going to be responsible for that?” the expert said. Vladimir Dvorkin, a senior scientist with the Institute for World Economy and International Affairs, shares a different point of view. Russia should continue testing the Bulava missile, he believes. “One should investigate the reasons of the sixth unsuccessful test launch before making hasty conclusions,” the official said. 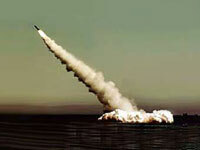 “It is quite possible to take the missile to the operational condition. An Unsuccessful launch is a sad event, but it does not mean that we should refuse from the missile. There is no alternative to Bulava,” the specialist said.